Strange Tales #167, April 1968 | 'TAIN'T THE MEAT… IT'S THE HUMANITY! Published in April 1968 this issue of Marvel Comics’ Strange Tales #167 featured one of my all-time favourite Nick Fury covers. Pencilled by Jim Steranko this classic image of a charging Fury, flanked by his fellow agents of SHIELD is, for my money, one of the finest to depict the superhero spy. Steranko joined the title 18 months earlier (inheriting the title from comic legend Jack Kirby) and quickly stamped his personality on the character, imbuing the title with a hip, Sixties vibe that at time bordered on the psychedelic. Steranko experimented widely with the comic book format, creating some of comic-doms greatest visuals – this issue for example featured four full-page splash pages that joined together to form one giant widescreen image. The artist also explored new typography and visual effects that helped to make Strange Tales one of Marvel’s hippest titles. 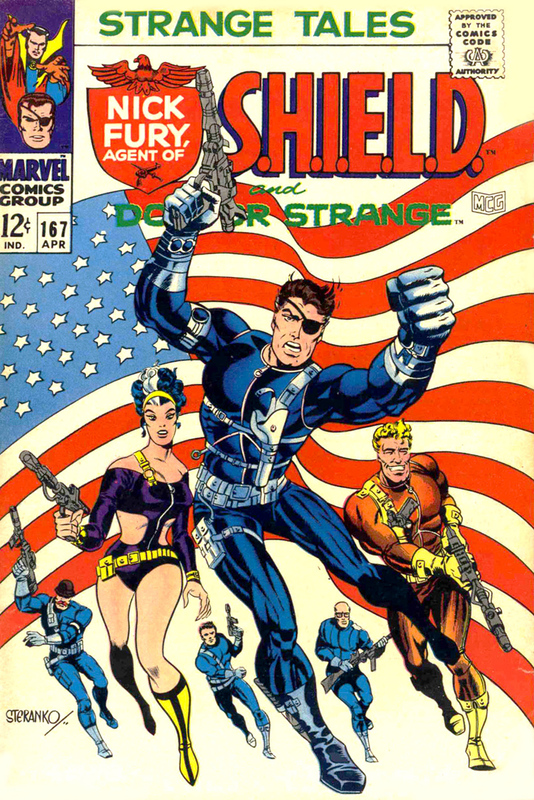 Steranko’s work with the character was so successful that two months after this issue appeared Fury was given his own title: Nick Fury, Agent of SHIELD. 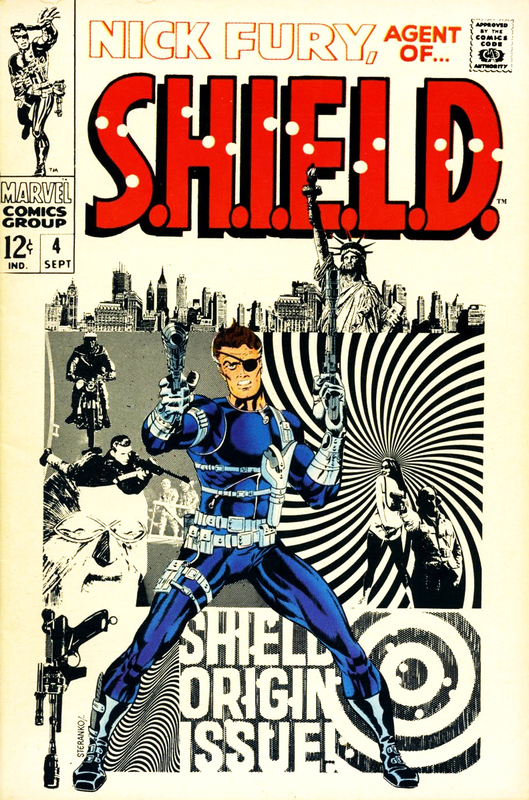 Steranko then really let his hair down, creating some of the comic industry’s most iconic images – with issue #4 and its trippy visuals now widely regarded as one of the finest comic book covers ever. Still, as much as I admire that cover Strange Tales #167 is still my favourite. Whenever I think of Nick Fury it’s the cover to Strange Tales #167 that I think of first. Fury’s classic hero stance — with the American flag waving in the background — is perfect Fury and pure Steranko.